Now that we’re in October, the climate is either warming up or cooling down as the season changes; but in K-pop, things are definitely heating up with a bunch of comebacks headed our way. And next up is none other than Shinee, preparing to drop fifth studio album 1 of 1 this week. 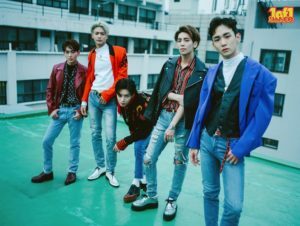 Shinee is riding the ’90s nostalgia wave in a big way, going so far as to release a limited edition cassette tape version of the album — which is already sold out. Well, at least now a new generation of music listeners are going to learn another use for those pens and pencils. The groups’ outfits also reference musical acts like Guy, while also reflecting Korean style from that decade. Which look are you liking: the suits and skivvies, the jeans and jackets, or both? If you like neither, it’s OK — just look back to other style moments from Shinee’s past. I’m also looking forward to hearing the New Jack Swing title track (hey, another Guy influence!) While we countdown to the big Shinee comeback, why don’t we share our favourite Shinee moments? I’m still hung up on this Minho walking meme, so feel free to remind me of other great moments in the comments below!